Since the 2008 global financial crisis, China has notably emerged as one of the twin engines of world growth. 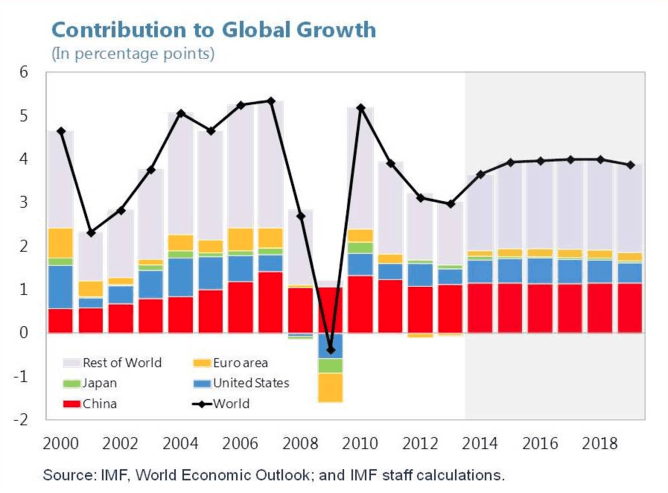 China has contributed as much to world GDP growth as the US in the past decade and a half, and even more than the world’s biggest economy since the 2008 financial crisis, according to the IMF. Indeed, the IMF projects that China will generate around double what the US contributes to world output until the end of the decade. Together, the US and China are expected to generate as much world output as the rest of the world put together. Prior to China integrating with the world economy, the US was the biggest and sole engine of global growth as it accounted for nearly a quarter of world GDP, based on market exchange rates. So, it’s the rapid growth of China, which rose from accounting for a mere 2% of world GDP in 1995 to around 15% now, that helped the world economy grow so quickly in the 2000s. As China slows from the nearly 10% growth rate that it clocked in the first three decades of its reform period, which began in 1979, to what is thought to be a more sustainable 7% or so, the world economy is likely to slow with it. The main areas where the impact will be felt would include not only commodities, but also consumer goods, including luxury goods. The countries most affected by a Chinese slowdown are still likely to be those that export a great deal to China, notably commodity exporters such as Australia. As Chinese demand for raw materials and commodities decline, there will be a knock-on effect in terms of their economic growth. For Australia, China accounts for around one-third of all exports. For Sub-Saharan Africa, China is the the largest trade partner, accounting for around one-eighth of all trade. But the impact will be concentrated since five countries account for three-quarters of all of Africa’s exports to China: Angola, the Democratic Republic of the Congo, Equatorial Guinea, Republic of Congo, and South Africa. A Chinese slowdown means fewer of these changing hands. China has surpassed the US as the most important trading partner for Latin America, which has traditionally been seen as America’s backyard and therefore most susceptible to the economic fortunes of its northern neighbour. But that is no longer the case. Latin American exports to China have risen to account for a record 2% of the GDP of the region. As China’s growth slows, its imports have fallen by 8% from a year ago, as seen in the latest data for July, following a similarly sizeable 6% drop in June. The slowdown has been felt in the commodity price falls seen throughout the summer that has led to tens of thousands of job losses by oil and coal companies globally, as well as others. But, it’s not just commodities. Capital goods imports have also fallen, which will affect countries like Germany where exports to China account for around 2% of GDP. Germany itself accounts for the bulk of EU exports to China so the largest country in Europe, which has recovered on the back of exports, will also feel the impact. Indeed, the European Union is China’s largest trading partner, and China is the second-largest trading partner of the EU after only the US. So, a slowdown in China will affect Europe, which is also felt in the profit warnings issued by European companies such as Burberry and BMW as their sales in China slow. 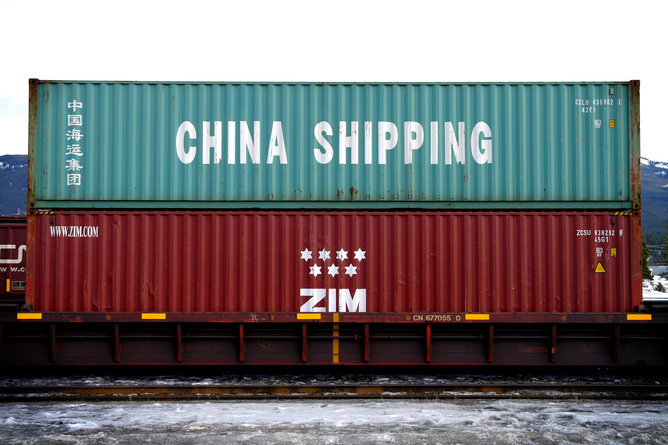 Exports from the US to China, by contrast, are less than 1% of GDP. That stands in contrast to Japan where exports to China amount to a large 3% of GDP. But that doesn’t mean that American multinationals will be unaffected. For instance, the world’s most valuable company, Apple, sells more iPhones in China than the US, and its CEO has reassured markets more than once that the Chinese slowdown won’t negatively affect their business. Finally, the Chinese slowdown has been most visibly seen in financial markets. China’s stock market is largely closed to outside investors so does not have a direct impact on global investors. But, despite rebounding from their initial fall, equities markets are certainly reacting to the impact of a Chinese slowdown. The UK’s FTSE will feel this most acutely, as it has a large portion of commodity stocks and around half are multinational companies, making it one of the most open bourses in the world. No wonder UK stocks experienced their worst one-day fall since the 2008 financial crisis when China’s market tanked. Undoubtedly it’s unusual for the world’s second-largest economy to be a middle-income country that is not entirely market-driven. Given the importance of China to the world economy, it’s time to get used to monitoring China as well as the US even more closely and becoming accustomed to the greater ups and downs that are likely to be seen in the global economy as a result.